Google Scholar is often helpful for finding scholarly articles on your topic. It includes links to articles from a wide variety of academic publishers, professional societies, preprint repositories and universities, as well as scholarly articles available across the web. Many articles provide links to other articles that have cited the first article. Some articles may contain statistical content. 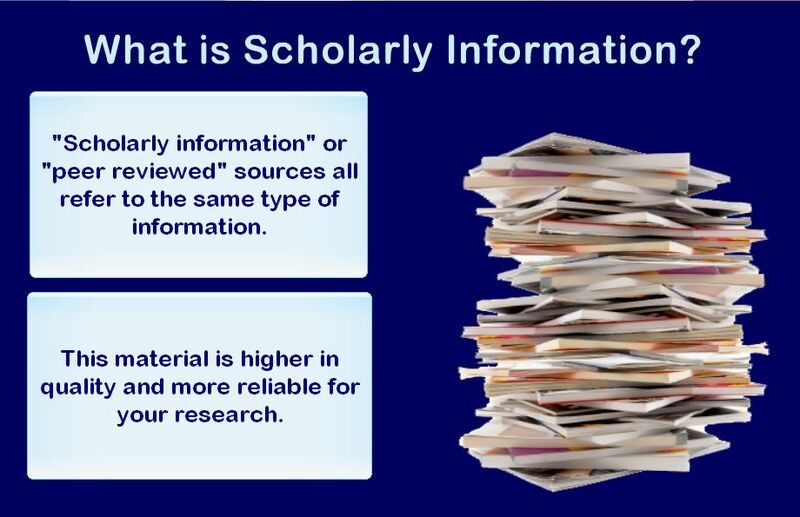 Instructors often ask students to find “scholarly”, “academic”, or “peer reviewed” sources of information for their research. These terms all refer to the same type of information – sources based on in-depth research, and are considered higher in quality and more reliable for your research. These sources can range from chapters within books or entire books, or journal articles, but all have common characteristics that can help you recognize that type of information. Written for professors, students or researchers. Have a plain appearance and titles may include words like "Journal," "Transactions," or "Quarterly”. Articles are reviewed by a board of experts or "peer reviewed." Follow a standard format: abstract, literature review, methodology, results, conclusion, possibly footnotes, endnotes and/or bibliography. May include tables, graphs or illustrations to support research. May have a bright cover with many glossy pictures. Designed to attract a broad segment of the population. General editors of the magazine review articles. May include tables, graphs or illustrations. May have a bright cover. Provide information of use to a particular industry. Advertising is used to appeal to those in the field. Here is a handy checklist to help you in determining if a work is scholarly or not (see the PDF in the link). Audience - Who is the intended audience? Is the information slanted? Authority - Is the author/organization credible? Do they have a liberal/conservative focus? Authenticity - Is the information on the page correct? Purpose - Why was this information generated? Is there an agenda? Scope - Does the site cover the information you need? Support - Is the information supported?